I'm super excited today to share some wonderful news I've been holding onto for a little while now. I've been asked to join the CardMaker Magazine Blog Team! Every day from now through December, you can check out the CardMaker blog to see some fun card and paper crafting projects created by me and their fabulous new design team. I invite you to visit their blog to learn about the other talented designers I'll be joining. While you are there, make sure to sign up to receive email updates on their blog posts and/or to get the CardMaker newsletter. For those of you who don't know, CardMaker Magazine, is published quarterly in both digital and print formats and features instructions for creating handcrafted greetings for every occasion. It was introduced as the first major magazine devoted to the card-making craft in 2005 and it remains the leading print-and-digital publication for card-making enthusiasts on the market. 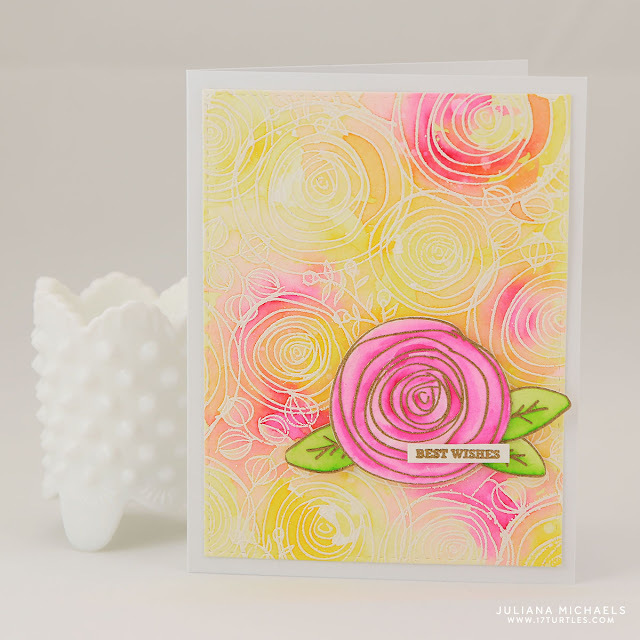 To celebrate, I created a little card to share with you today using the Ranunculus stamp set by Simon Says Stamp and my favorite Zig Clean Color Real Brush Markers. I stamped the background onto watercolor paper using Versamark Ink, sprinkled it with white embossing powder and heat embossed it. I then colored it in with the Zig markers and added some water with a paint brush to blend the colors. For the focal image, I stamped the flower and leaves on watercolor paper and heat embossed it with gold embossing powder. I then colored them with the Zig markers and fussy cut them before adhering them to the card front. Thanks so much for stopping by today and for joining me in this little happy dance of mine! It's a beautiful card, Juliana! Congratulations! Beautiful card! I know you'll have lots of inspiration to share with cardmakers through your participation on this design team! What a SPLEDIFOROUS card. So very, very pretty....BIG congrats on your new team. Sounds fun-tastic! And I have to tell you, I FINALLY used a cut file of yours from last Christmas the other day. EVENTUALLY I get there, LOL!!! Thanks so much Lizzy! WTG!!! I hope you let me know when you share it. I can't wait to see what you created!! !